Michael Klein is not the average academic, happy to live in an ivory tower. He is deeply concerned with the ultimate impact his work could have on society and is looking to make a “contribution to better public policy,” as he told Impakter in a recent interview. Currently teaching at the Frankfurt School of Finance and Management and Senior Adjunct Professor at Johns Hopkins University, from 2000 to 2009 he was Vice President of the International Finance Corporation, a member of the World Bank Group focused on financial and private sector development. Prior to this, he served as Chief Economist of the Royal Dutch/Shell Group (1997-2000), where he advised on worldwide economic developments and industry issues. In 1991 he became head of the unit for non-OECD economies at the Economics Department of the OECD. These are the highlights of our conversation with Professor Klein. Q.What made you decide to become an economist? M.K: Mixing what makes sense for citizens with “the politics” at hand. Q. Water is fast becoming an issue on the international scene. Your take? M.K: Scarcity issues are looming larger. Water is essential. In the photo: A young boy in Africa collecting dirty water from a stream. Children around the world waste hours collecting water full of diseases and parasites instead of going to school. Q. In what aspect of the water crisis are you most concerned with? M.K: The biggest concern is, of course, the hardship of people who do not have access or the looming scarcity in some areas. The number one fear is making it all worse through needless policy mistakes: for example, encouraging waste by giving away water for free. “Free water” – sounds so good, makes so little sense. Q. Do you believe there are viable solutions that can address the problem of water scarcity? M.K: Water problems seem eminently solvable; plus they are often local – that makes it likely solutions of some type will actually be found. Global warming is a bigger threat and harder to solve. Geo-political tensions, the looming threat of major wars – that is bigger too. Q. Speaking of climate change, as an economist, do you see how the incessant need for expansion of our market-oriented economic system can threaten a planetary collapse? M.K: Let’s not forget that, because of “expansion”, poverty rates have fallen like never before in history. For the first time ever it is conceivable that extreme poverty may be largely history during the lifetime of people now alive. There is more hope for a better life on earth than ever before. According to Gallup polls, the people by far most optimistic about improved economic prospects live in Africa. In any case, what is that system that needs unfettered expansion? Lots of people in lots of systems – not least former centrally planned systems – liked and like to be better off, get richer, and ignore the costs. Markets are actually mechanisms that help manage scarcity. If the world could agree on a carbon price or tax, climate change could be tackled more decisively. Why is that so hard to agree on? Because it is hard to find a global solution when nations are sovereign with divergent interests. In the photo: Cartoon about the privatization of water. It depicts the perceived injustice of charging for a natural resource essential for all life. Q. Could you imagine water scarcity ever leading to water being a private good, controlled by governments in the name of the people, like in the scenario of the recent movie Mad Max: Fury Road? M.K: Sounds more like a James Bond movie – Quantum of Solace. Exciting maybe, but not enlightening. What is it that we want? Affordable access to water for all and a way to deal with scarcity of water. Q. Access for all implies a lot of people…How many? M.K: Today some 750 million people do not have access to safe water. 2.5 billion do not have good sanitation. That in turn creates some of the main health dangers for poor people. Of course, humans need water to live. It costs poor people a lot. They may have to walk for miles or they may have to pay private water vendors. Many pay much more per liter than richer people who are connected to modern water systems. Water is a necessity. The history of development is plastered with great master plans and policy ambitions to provide water for all. At the same time water prices for those who are connected in developing countries are typically very low, ostensibly to make it affordable. Yet, in a number of poor countries more people have access to cell phone service than to good water. In Tanzania it is estimated that 97% of people have access to commercially priced mobile phones – either because they own one or can rent time on one from vendors. Only 33% have access to piped water – about the same as 25 years ago. Mobile phone investors are providing service in the most difficult country environments. Water providers, mostly state-owned, find it more difficult to invest, maintain and operate systems that reach the poor. Q. A paradoxical situation. Why is that? M.K: Water prices typically cover only about 30% of cost in developing countries. Regardless of ownership water companies simply cannot provide decent service, much less invest, at these prices. They need additional contributions funded by taxes. Tax receipts are often weak and volatile precisely in the countries with bad access to water. Low water prices also lead those who have access to water to waste it. For example, letting the shower run to cool the house when it is hot, is encouraged when water consumption is not metered and charged for. People with swimming pools are happy. Utilities are weak, poor people have no access and pay a lot more than richer ones. 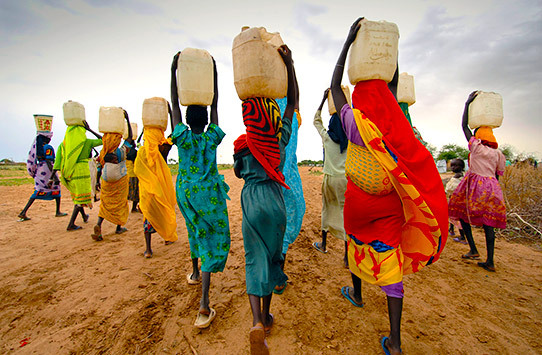 In the photo: Women in Africa carrying water on their heads. The United Nations estimates that Sub-Sahara Africa alone loses 40 billion hours per year collecting water. Q. So you are saying that income inequality is at work here? M.K: Low prices benefit the better-off who are connected to pipes. For mobile phones people pay prices that fully cover all costs including financing costs. Investors are motivated to deliver. When mobile phones were introduced most people thought, “they are a luxury good”, “they do not matter for the poor”. “Let’s not care about their prices”. “Let’s focus on cheap access to necessities”. The result? Access to the service that is fully priced has exploded; access to the necessity has languished. Where official water services do not reach, private vendors fill the gap. Their prices are high, because their costs are. Q. You are advocating that water prices should reflect the full cost of providing that water. Why? M.K: Why not allow people to pay full cost for water? Utilities whether in public or private hands could count on steady cash flow to support investments and operations. Waste of water would be more easily curbed. Lots of people would pay less for better service. Q. You see water as both a public good and a necessity? M.K: People should have good water service. They will get it when they have the right to pay for service. For the very poor, one can then provide special subsidy schemes to enhance affordability. Chile has an excellent scheme. Where the administration of subsidy schemes surpasses the capacity of government, it is better to focus on access first. Low prices without access do not mean anything. In the photo: Girl drinking water from public tap. 4.2 billion people now get water through a piped connection. Q. But what about scarcity of water? M.K: Is it actually scarce? There is plenty of water, but often in the wrong place or hard to use, for example, seawater. Most usable water goes to agriculture – worldwide some 70%. Farmers tend to pay very little, a few cents/cubic meter at best, whereas city water often costs a dollar or more. Incentives to conserve are largely absent. This can make water scarce for human consumption – in all sorts of countries, from the North of China to the South of California. Q. So the problem is in the rural areas not the cities? M.K: Colleagues of mine went to South India to discuss ways to cope with water shortages. Officials said, farmers would never agree to let go of their water – a matter of tradition and livelihood. Then they talked to farmers. Indeed, they like cheap water. But what about the following? Suppose as a farmer you were given the right to the water you now use and for which you pay little or nothing. However, you would have the option not only to use it for farming, but you could sell it to the nearby city for a dollar or more. Would you be willing to sell? Farmers quite liked the idea. Overall they would earn more than before from the meager profit from food production. At the same time cities would have the water they need. Water rights help manage scarcity. When they are allocated sensibly they can make everyone better off. Again look to Chile on how to make such systems work. Q. But if you really do not like property rights and pricing, what can you do? M.K: You can try to spend a lot of money on alleviating shortages. China is suffering from water scarcity in the North. The country is building expensive long distance pipelines to bring water from the south. The most momentous such water pipeline project was undertaken by Gaddafi in Libya – with artificial lakes in the desert and gigantic water pipes (4 meters in diameter), the “great man-made river”. Oil rich countries like Saudi Arabia can afford to pay for desalination, a technology that has become much cheaper and can now produce water at prices of less than a dollar per cubic meter. In the photo: Boys in Karachi, Pakistan; a city that requires 1,000 million gallons of water every day and can only carry half of that water to the city. Q: You’re saying we can pay our way out of water shortages? M.K: We can. But without sensible pricing, investment will not be forthcoming in many places and conservation incentives will be weak to non-existent. When we cannot pay our way out anymore, we can ration water and impose costs on people this way: Have service only for some time of the day or turn off the tap when a certain amount of water has been used. In emergencies, that may be needed. Q. So you are suggesting water rationing in emergencies? M.K: As a basic solution rationing will be worse than pricing, an administrative nightmare and ripe with corruption. That is what many people in poorer countries face right now. There, unequal access is not driven by privatization; it is typically a consequence of public sector solutions ostensibly driven by social purpose, but either mismanaged or corrupted for private gain. Q. So what should we do to help the poor? M.K: If you are worried about poor people – give them an income subsidy, a basic minimum income. There are many good and practical experiences now with cash transfer programs. Or you can set a low price – a lifeline rate – for basic supply of water; but that can only work when access to water actually exists. All in all, sensible water pricing sounds like a really good idea to me. Water rights sound like a really good one too. In the photo: Lagos is among the many cities in the global south where investment in water supplies is desperately needed, yet there is no consensus on whether the answer lies with private management, the public sector, or a combination of both. 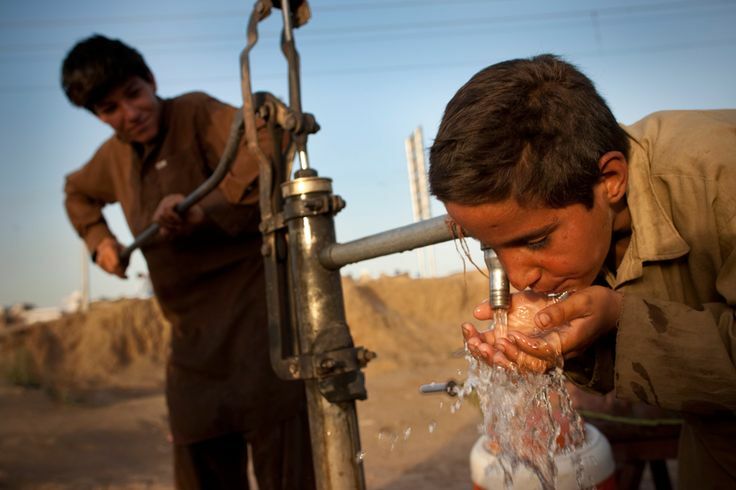 The IFC and other entities proposed awarding a single giant water company a long concession in return for providing technical expertise and millions of water connections. Q. Are you recommending that water firms managing supply should be therefore private? If not, why not? M.K: Whether the water provider is public or privately owned, it will be regulated to earn just enough to cover its costs including financing costs. When firms are privately incorporated they may be better able to resist political meddling. That is the main argument in their favor. And a number of public utilities are corrupt. Q. Won’t privatization of water make it more expensive to users? M.K: Some say, that private profit makes things expensive. No. Public and not-for profit firms also need to make a profit if they want to perform – they just cannot distribute it to shareholders. Therefore, they cannot attract equity on commercial terms but need de facto some form of donation instead as capital. And the cost of public debt may look cheaper than that of private debt in many places. This is not because public firms manage risk better, but because taxpayers bear risks that are otherwise borne by creditors. Except, taxpayers do not get paid for this – their money is just taken – a cost to citizens that one should keep in mind. Q. So, in your view, what will actually happen? Are we on the verge of massive increases in prices and privatization? M.K: Sounds highly unlikely. The biggest issue is pricing. Rich countries typically charge full cost for water utilities. However, pricing for farmers remains a major issue. Water pricing remains politically toxic. Privatization remains highly unpopular. Very few water utilities in this world are privately owned – and this will remain so. In the photo: Clean water is essential. 80% of all illness in the developing world comes from water-borne diseases. Q: If politically nothing can change or is likely to change, how can we move forward and solve the problem? M.K: Developing countries may gradually raise water prices to cover costs. That would help. Meanwhile, water utility subsidies will continue disproportionately to favor better-off customers who happen to be connected and not the poor who are not connected to modern water systems. Q: So for the poor, the water situation will only get worse overtime? M.K: Only when water scarcity becomes really, really, really acute and after all sorts of other things have been tried, will there be a move towards more water rights, prices that reflect scarcity and water trading. Meanwhile water prices will remain low for favored groups. Waste will continue, costs for energy-hungry schemes like long distance transmission and desalination will rise – and add to greenhouse gas emissions. Q: The winners in all this? M.K: The biggest profit driven, unregulated water firms will remain the sellers of bottled water – a good business but hardly one that yields extraordinary profits. And one you can easily do without, if you have decent tap water.